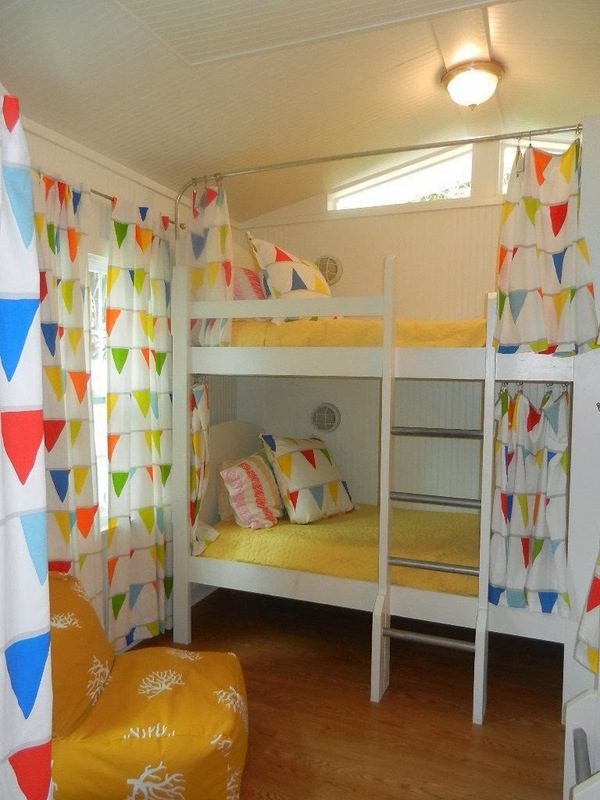 Very Very Vicky: A "Makes-You-Smile" Bunk Room! Coast Awhile Cottage is a spacious home with 5 bedrooms plus a separate 1 bedroom apartment and when designing it I envisioned multigenerational family groups coming for a stay. I could just imagine lots of cousins hanging out together just like I did with my cousins when my family had a reunion at Tybee over 40 years ago. The more the merrier! 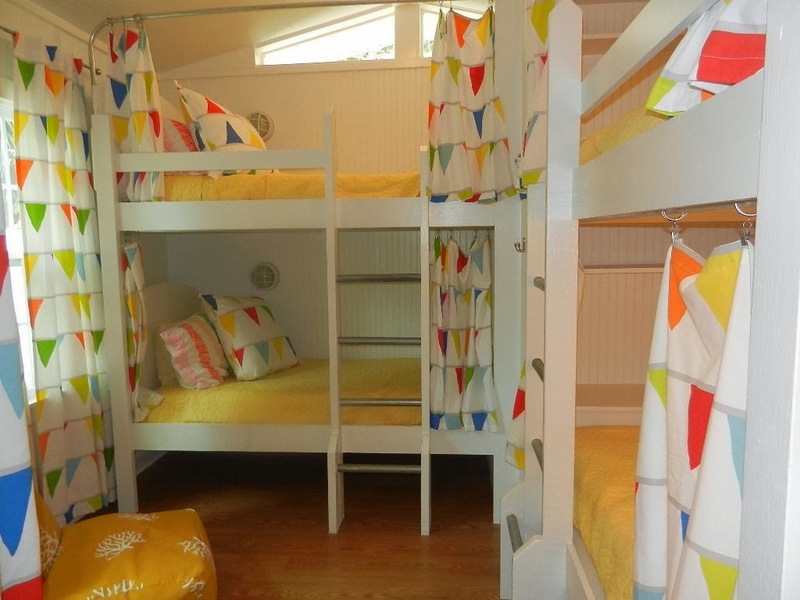 The bunk room is not very big but I wanted to squeeze two sets of bunk beds in. They were custom made by Peter Dittmar and designed by me and Jane Coslick based on previous projects of hers plus a few Pinterest pins that I liked. We had space in the corner to add some shelves for each person so they could have some storage. I thought it would be nice for the bunkmates to have their own light for reading, etc. and these inexpensive nautical ones fit the bill perfectly! I also liked the idea of having curtains so if one person felt a need for privacy or wanted to shut the light out to nap, they could. Peter fashioned some strong metal bars for us to use as curtain rods on the beds. Pre-installation--they are leaning against the lower bunk. I found some wonderful curtains with a flag design at Ikea in the children's department and bought several pairs so we could use them on the windows and french door as well as some to cut up and sew into curtains and pillows for the beds. The yellow bean bag seat was a great bargain from Joss and Main, one of my favorite daily sale sites. You should check them out! I also found clearance bedding at Target and wonderful decorative pillows at Garnet Hill (on sale of course). This little lime green dresser came from a flea market--ready to go! No painting or refurbishing required. I love that it offers both room for hanging clothes plus drawer space for each guest. 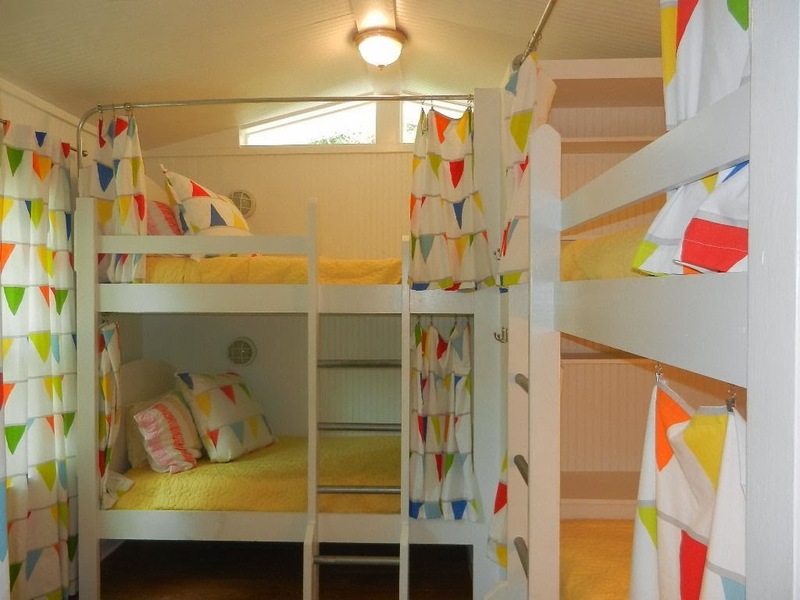 The bright colors are cheerful, and the space is well used. Thanks Kathy! Hope your blog is up and running soon! You've really done it, Vicky!! !